Japanese American volunteers pose for a photo in Aiea, Oahu, after being accepted by the U.S. Army. Photo courtesy of Hawaii State Archives. Americans of Japanese ancestry (AJAs) who served the United States in World War II answered distrust and suspicion with unsurpassed service and sacrifice. AJAs, or Nisei, of the 100th Battalion and 442nd Regimental Combat Team paid a bloody price in Europe to become the most decorated regiment in U.S. history. In the Pacific, Military Intelligence Service (MIS) AJAs made priceless but secret contributions to victory over Japan. Before the war, Japanese made up 37 percent of Hawaii’s population. The war’s final tally found AJAs were 63 percent of the Hawaii residents who died in service to the United States. Cultural values – duty, honor, mutual obligation – helped the Nisei succeed, but they left no doubt that they were Americans. Japan’s Dec. 7, 1941, attack on Oahu cast suspicion on all Japanese in America. Few mentioned the faithful service of 2,000 Nisei soldiers – former National Guardsmen and recent draftees – in Hawaii that day. One was Torao Migita, killed by friendly fire in Honolulu while on his way to report to Schofield Barracks. Also responding were University of Hawaii ROTC cadets, most of them Nisei, who became the nucleus of the Hawaii Territorial Guard (HTG). They were issued bolt-action rifles and five rounds apiece to guard key locations. Six weeks later, however, the HTG dismissed its Nisei members without explanation. Rather than wallow in rejection, 170 of them organized as the Varsity Victory Volunteers (VVV) and presented a petition to Gen. Delos Emmons, the military governor. It said, “Hawaii is our home; the United States, our country. We know but one loyalty and that is to the Stars and Stripes. We wish to do our part as loyal Americans in every way possible and we hereby offer ourselves for whatever service you may see fit to use us.” The VVV spent the next 11 months performing manual labor for the Army to demonstrate that they deserved a chance to fight for America. In February 1942, all persons of Japanese descent were ordered out of the West Coast and federal authorities began herding them into concentration camps in the U.S. interior. Meanwhile, the Selective Service reclassified all Japanese as enemy aliens ineligible for the draft. In mid-1942, 1,400 Hawaii Nisei were removed from their units and shipped to the Mainland. At Camp McCoy, Wisconsin, they were organized as the 100th Infantry Battalion and adopted the motto “Remember Pearl Harbor.” At the same time, MIS Nisei language specialists were deploying to the Pacific in the war against Japan. Meanwhile, the VVV were crushing rocks and digging trenches to prove their patriotism. They got their chance in early 1943, when the War Department and White House authorized creation of a Nisei regimental combat team (RCT), the 442nd. AJAs couldn’t be drafted, so volunteers were sought. About 1,100 responded on the Mainland. In Hawaii, nearly 10,000 volunteered and more than 2,600 were inducted. The 100th Battalion entered combat near Salerno, Italy in September 1943. 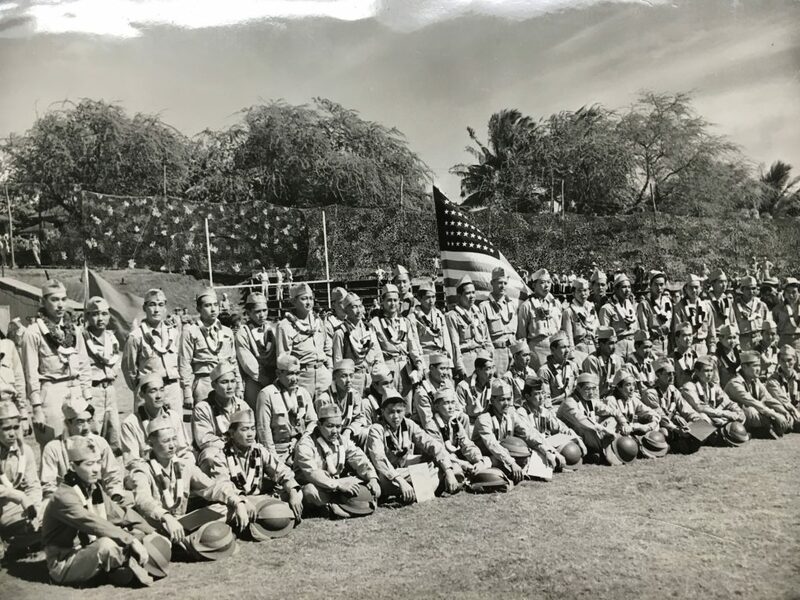 The Hawaii Nisei soon earned battlefield respect and the nickname “Purple Heart Battalion.” The 442nd RCT joined the 100th Battalion near Anzio in June 1944 and fought fiercely in Italy then France, where the 442nd rescued the “Lost Battalion” when other U.S. units failed. The 442nd’s 522nd Field Artillery Battalion was shifted to Seventh Army’s drive into Germany and helped liberate death camp inmates near Dachau. The rest of the 442nd returned to Italy and broke through the Germans’ Gothic Line. In the Pacific, MIS Nisei served from Guadalcanal and Burma to the Philippines and Okinawa, as interpreters and translators, electronic eavesdroppers, spies and guerilla leaders. They captured and interrogated prisoners, flushed caves and fought as infantrymen, all while at risk of being mistaken for the enemy and shot by fellow GIs. After the war, the MIS Nisei had a vital role in the occupation of Japan. In Hawaii, another Nisei unit, the 1399th Engineer Construction Battalion, built dozens of major military facilities. With few exceptions, the Navy, Marine Corps and Army Air Forces refused to enlist AJAs, but 33,000 of them served in the Army in World War II. In July 1946, President Truman honored the 442nd and said, “You fought not only the enemy, you fought prejudice, and you won.” Two years later, he ordered the end of racial segregation in the military. After the war, many AJAs earned college degrees on the GI bill that would have been unattainable before the war. They came home to open up Hawaii’s society and economy and paved the way for statehood. Prominent Hawaii Nisei veterans included U.S. Senators Daniel Inouye (442nd) and Spark Matsunaga (100th) and Gov. George Ariyoshi (MIS).